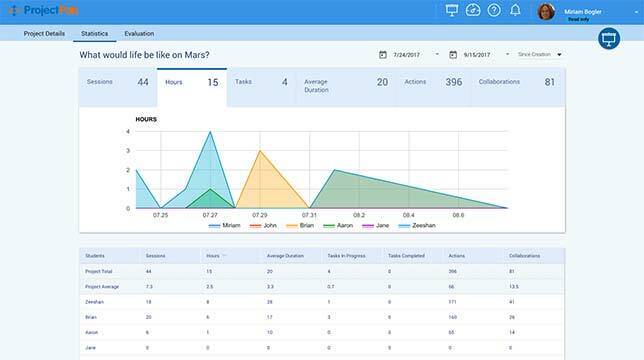 Ed tech developer Project Pals has launched a new project management system aimed at classrooms engaging in collaborative project-based learning. The system, called Project Pals, aims to provide a space in which students can collaborate and upload content; but it also includes tools for teachers to manage group projects and analyze aspects of the students' work, such as who contributed what to the project. And it can serve as a showcase for the students' work to their classmates and parents. As the company explained: "Project Pals streamlines project-based learning (PBL) implementation by providing one shared platform for all phases of a project: students plan, visualize, and collaborate; while teachers monitor, respond, and evaluate. The platform is designed to play a role in a wide range of subject areas, such as research projects, scientific explorations, literacy development, and critical-thinking activities. The goal is for children to become lifelong learners with collaboration skills they need to succeed in the 21st century. By working through problems together and creating solutions, students build and enhance their skills across multiple subject areas." Three types of licenses are available for Project Pals. A classroom license for up to 20 projects and 50 students is free. A Team license for unlimited students and unlimited projects is available for $500 per teacher per year. And a school/district license supporting unlimited students and projects is available for $10 per student per year. Further details and access to resources can be found at projectpals.com.